9 November 2012 – The Rolex One to Watch for November 2012 is awarded to Saer Coulter (USA), who trains at Copernicus Stables LLC, California (USA). During the month of September, the 21-year-old jumped from 294th to 209th – a move up the Rolex Rankings of 85 places. Coulter was born in New Orleans, Louisiana (USA), although she was brought up in San Francisco, CA where she lives. She is currently enrolled at Stanford University, CA (USA) where she is Majoring in Art History. Riding is a family affair with Coulter’s younger sister, Audrey, also actively competing in the Jumper ring. The sisters are currently trained by Meredith Michaels-Beerbaum and her husband, Markus Beerbaum. Coulter showed tremendous promise as a junior jumper, riding to top finishes in many classes, which consequently helped her to make a smooth transition to the Grand Prix stage. Coulter first represented Team USA at the CSIO Buenos Aires (ARG) in November 2010. Partnered by Holsteiner stallion, Chalan, Coulter and her three team members – Lucy Davis, John McConnell and Megan Edrick – scored a convincing win over their Canadian and Argentinian rivals, who finished second and third respectively. 2011 proved to be a very successful year for Coulter and the Dutch Warmblood bay gelding, Springtime. At the beginning of March, the pair was second in the $50,000 HITS World Cup Qualifier in California (USA). The following month they picked up another second place finish in the $40,000 Blenheim Spring Classic II Grand Prix. 2012 has been an exciting year for Coulter, with her finishing 10th aboard Springtime in the United States Equestrian Federation (USEF) Selections Trials. The pair had a double clear round in trial two. 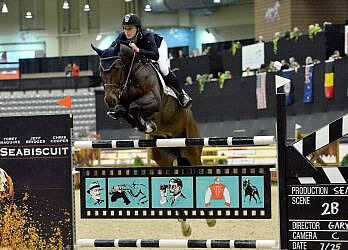 For their performance, Coulter and Springtime were named to the USEF Long List for the U.S. Show Jumping Team for the London 2012 Olympic Games. The U.S. rider’s successes continued in April in the 2012 U.S. Show Jumping Observation Event at the Del Mar National Horse Show, California (USA), where Coulter and Springtime finished third in the $100,000 Hermes Grand Prix of Del Mar. Coulter’s notable results during October 2012 include a third place finish in the $55,000 Land Rover Grand Prix of Sacramento aboard Springtime where the pair went double clear, and a second place finish aboard grey mare, Victory DA in the $35,000 Welcome Grand Prix, with both results coming at the CSI2* Sacramento International Horse Show, California (USA). Coulter and Victory DA also recorded a fourth place finish in the $35,000 ShowBiz Magazine Welcome Stake at the CSI2* Del Mar Fall Festival II, California (USA). Most recently, Coulter and Springtime finished fourth in the $250,000 Alltech Grand Prix at the CSI4*-W Alltech National Horse Show in Lexington, Kentucky (USA) behind accomplished riders including Mclain Ward and Candice King. December’s Rolex One to Watch will be announced at the beginning of December 2012. • Steve Guerdat (SUI) is currently ranked number one in the Rolex Rankings and therefore holds the Green & Gold armband which bears the words “Number 1, Rolex Rankings”. • Steve Guerdat shall wear the Green & Gold in all competitions whilst he is the Number 1 ranked rider in the Rolex Rankings.